Reminder: for those of you planning on going to the march Saturday, avoid long lines at the TAP vending machines by getting your TAP card ahead of time. More here. Dept. 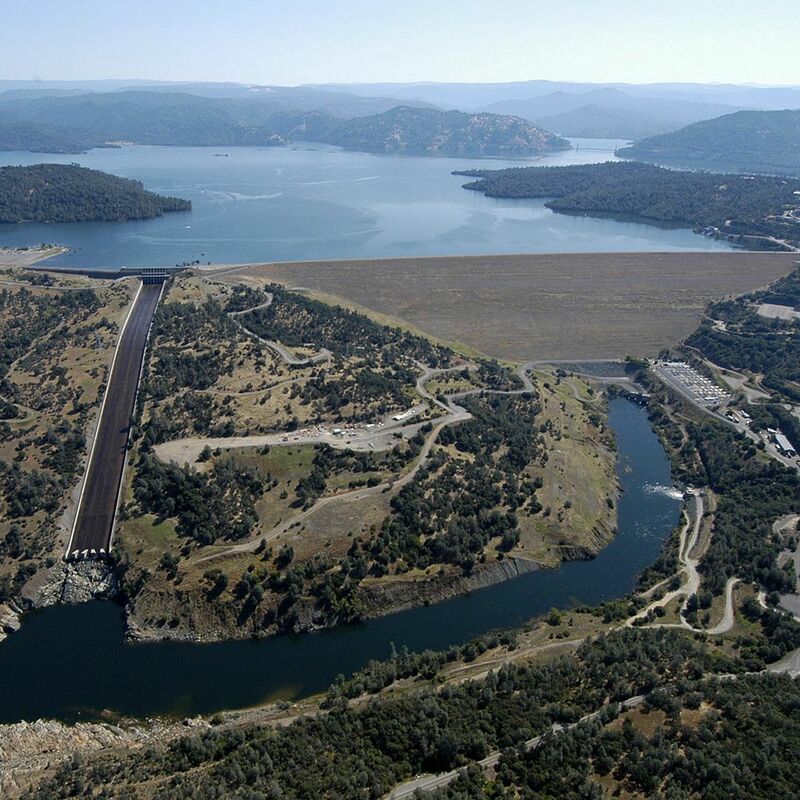 of Infrastructure Facts: I didn’t know Oroville Dam was taller than Hoover Dam. Now I do. Here’s what the lake looks like behind the dam. The lake can hold 1,152,723,003,027 gallons of water, btw. In 2016, Metro systemwide ridership dropped about six percent from 2015. Rail went up a bit from the prior year — thanks to the opening of Expo and Gold Line extensions — but bus ridership continued to fall steeply. As an accountability measure, Metro ridership estimates are posted online and anyone can visit the page and slice/dice the numbers different ways. So what’s going on? Metro officials told LAT transpo reporter they believe several factors are contributing to the declines, which have also been seen in other regions around the U.S. Among them: changing travel patterns by core riders who no longer ride, safety concerns among riders, slow bus speeds due to traffic, undocumented workers having the ability to get driver’s licenses in California, the difficulty of serving more than two dozen job centers in the county and service reliability issues and last (but hardly least), the popularity and cheapness of riding with the likes of Uber and Lyft. But tweaks over the years to routes and schedules may have eroded the efficiency of some workhorse bus lines that serve major corridors, or made the routes more confusing for riders. It has been more than a decade since Metro has examined and overhauled the bus network, Cheung said. As L.A.’s economy has steadily improved, traffic has grown worse, and so has Metro’s on-time performance. Agency figures show that about 76% of buses arrived on time in the 2014 fiscal year. This year, the number is near 72%. As Laura notes in her story, support for building a transit system has remained strong even when ridership has not: Measure M, a sales tax increase, was approved by 71.15 percent of voters in November. Measure R passed with nearly 68 percent approval in 2008 and Measure J failed, albeit with 66.1 percent support — just shy of the 66.67 needed. These are all good points, although I’ll add that there are usually a lot of parking spaces open at the Expo/Bundy Station in Santa Monica for those willing to pay $3 a day. It’s also worth noting that even though there is now 105 miles of Metro Rail, that’s in a county that has more than 500 miles of freeway. The idea of Measure M is, after all, to build a lot more rail and get it closer to a lot more people. @laura_nelson @metrolosangeles headways headways headways. At-grade LA street transit is just not going to work w/o dedicated lanes. That last tweet raises a good point: there has also been a light rail car vehicle shortage for the past year. That has impacted train lengths on the Expo and Gold Lines especially and meant, at times, more crowding. More Kinkisharyo light rail cars are being delivered but it takes time to break them in and prepare for regular service. Another point: speed certainly does matter to many riders. Metro and city of L.A. transportation officials have been talking about finding ways to trains and Orange Line buses more quickly through intersections — and I think if successful, those efforts would get more people to ride. There is also this: the Metro Board this month gets to again consider a new policing contract for the system. The current contract is with the Los Angeles Sheriff’s Department. The contract proposed by Metro staff would divide the work between the LASP, Los Angeles Police Department and the Long Beach Police Department. Metro staff says that would result in an increased law enforcement presence on Metro buses, trains and stations. The Metro Board delayed voting on the issue in December, but the Board now has three new members who weren’t there for that vote — Supervisors Kathryn Barger and Janice Hahn and Long Beach Mayor Robert Garcia. The full Board meets Feb. 23. Look folks. Ridership matters. It’s not the only way to measure a transit system — being there to offer rides to people with no other choice is important, too, and getting some cars off the road is also important. But we want to see healthy ridership across the system and well outside of peak hours. On any given day, Metro still carries more riders than many other transit systems — but clearly the numbers show something is happening and hopefully those numbers can be reversed. Your thoughts, readers? I know you have them! Urbanize LA: Nothing about ridership, but check out the headlines on the many posts on Urbanize LA’s front page: most of those developments are near rail lines or the Orange Line. Metro Rail lines running every twenty minutes after 8 pm. is infrequent for many riders. Also, service cuts probably contributed to low ridership. For me, no weekend service on Metro Rapid Lines 780 and 794 adds an extra thirty minutes to my commute to Downtown LA, Hollywood, or Pasadena. At the Expo/Bundy Station, does one pre-pay the $3 parking fee upon entering or upon exiting the parking lot? Is this done only with a TAP card? If so, what happens if the balance on the TAP card is insufficient? Does the parking also cost money during “off-hours” and weekends? Yes you do have to pay on the weekends and no it doesn’t take money from your TAP. What I believe it does (I could be wrong here) is confirming that you are in fact a transit rider. I still had to pay with a debit card after it asked me to tap my TAP card. As a regular Expo line rider, the most annoying, daily occurrence is sitting at the intersection of Crenshaw and Exposition for several minutes as cars cross in front of us. And repeating this procedure at Western, Normandie, Vermont, Jefferson, Adams, Washington, and Pico. I regularly hear riders boarding in Santa Monica saying, I wish they had built this system right. There was so much potential but they really messed up by making it slow. I’m well aware that Expo was built on a budget, particularly Phase I. And I know faster means more expensive. But there are improvements that can be made by fixing the signaling and perhaps looking into grade separation projects at key logjams. The absence of preemption is just insane. It solidifies to new riders the perception of Metro as just another incompetent government transit agency. Really, the Blue and Expo lines should be grade separated where they share track, and should receive absolute signal preemption elsewhere. If Trump manages to deport a lot of undocumented immigrants, Metro’s ridership could take a catastrophic hit. Increasing ridership is possible, but we’ve got to build dense, mixed-use buildings near all transit stops, including bus stops, and make parking expensive. Look at any city with strong ridership: urban form is key. There are a few less densely populated areas around Santa Monica that are about half a mile from the nearest bus stop, like Laura mentions, but it’s far less than 97% when you take both agencies into account (Metro and BBB). If they’ve got a car, though, they really are better off driving to one of the three stations with parking lots. Public transit isn’t (yet) set up to serve absolutely every local neighborhood, and admitting that is important. (1) Make the trips fast–elevate where possible (including going back and elevating existing lines) and at the very least give signal preemption. (2) Make the trips frequent–20 minute waits at any time of day other than 10pm-2am is unacceptable. (3) Build rail in the densest parts of the city (i.e. Central LA) first. If you have multiple lines in the same neighborhoods, that helps mitigate the first mile/last mile problem. Enough rail density in the urban areas means that you no longer have to worry about getting to the stations–walking is a realistic option. (4) More interconnectivity between the lines–all new lines should have multiple transfers to existing lines. Points 3 and 4 mean we should be prioritizing Purple Extension to Santa Monica (with ultimate connection to Expo), Crenshaw Line northern extension and Vermont Rail (not BRT). Here’s hoping that the 2017 Long Range Transportation Plan includes all three and will enable them to be built much faster than the Measure M timelines. The key point is that despite increases in rail, the decreases in bus outweigh them. Buses are the workhorse, because despite the fact that measure M is adding a lot of rail, it will never provide the full coverage that the bus grid does. Or at least will take decades of construction to come close. Talking about how great the rail will be at attracting riders does not address this point. The drops are coming from the buses, and if you want to stem lost bus riders, you need to improve the bus system! This doesn’t mean you have to spend tons of capital on fancy wifi and entertainment on new buses to attract “choice riders”. Every time I hear that phrase I cringe. Metro had gone through an analysis of the service and had published a plan to attempt to emulate the success of Houston’s bus system redesign. And then never implemented. What gives? Basics: provide frequent service (<15 min) to more people for more of the day. Have you ever considered the nature of the jobs that are used by your core public transportation takers. I have a friend that gets a subsidy for riding metro but refuses to use it becuz the doubling of time versus driving. So lucky for me i can use his tap card and it makes for a cheap joyride on the weekends. Could it be that with the loss of factory jobs here in the greater los angeles county that would mean loss of those riders I mean as a professional unless there is rail transport on a timely manner and only a bearable increase in commute time would i consider using the service on a weekday. -Metro buses are not very effective on trips over five miles. -Metro buses are not effective for trips requiring multiple destinations unless going into one of the city centers. -Metros App advertises Lyft and Uber. -Metro buses sometimes are shelter for the homeless; a greater social issue that Metro absorbs due to past inactivity. Its becoming unsanitary to ride with some people that have proper medical issues or poor hygeine due to mental health. -Metros riders are largely inefficient…. “BACK DOOOOOR!!!”.. Cmon, you shouldve gotten ready for your stop a 90 seconds ago. -Metro Buses are on a Cinderella Schedule. Ever get stuck in Hermosa Beach after 9pm? I have..
-Metro Buses sometimes run every hour and a half. I don’t think there is a drive in the county that takes 90 minutes end to end with no traffic. -Metro bus stops are too small and very ineffective at particular intersections. Can I transfer without crossing the street please? If Im stuck at a red light, could there be a reserve discharge only policy especially If I have to double back for a transfer. These are small technical issues Ive dealt with and tolerated my entire life since RTD, but I know the weak at heart would never ednure more than once. Currently, any trip over five miles with no raiI; I try to avoid, order in, Lyft, or other. Vermont Blvd being the exception. The new MTA webpage still isn’t working effectively at all. When ever I check for alerts and advisories the page isn’t available why upgrade something when it isn’t working. The old MTA webpage worked much better than this supposedly new web site. This web site should have been tested to make sure that it was working properly before it was implemented. The old MTA web site should have been kept in place until all the problems were worked out with this new web site. If there are problems on any of the metro buses or rail lines we don’t know about it until we are in the midst of the problem and have no idea what is going on. IF THE ALERT AND ADVERSORY WERE WORKING WE WOULD KNOW AHEAD OF TIME IF THERE WAS SOME SORT OF PROBLEM SO THAT WE COULD MAKE ALTERNATE PLANS OF TRANSPORTATION. MTA needs to think about their customers and their needs since we are ones that travel on the buses and rail lines. As others have stated, issues in the rail network aren’t as important to bus riders as consistent and ongoing failures to invest in the Metro bus system on a system-wide or by-line basis. I am transit dependent and live off the 704. Even though it is one of the most heavily used bus lines, you still get 30 minute headways in the middle of the day—which is unacceptable. If any part of the RAPID system has more than 15 min headways, then it’s not RAPID anymore is it? Despite the over abundance of research and examples worldwide of successful implementation of all-door boarding, Metro only did a pilot on the 720 last year. Now the Silver Line has all-door boarding—well it should have already since it is billed as a BRT service. When is Metro going to implement all-door boarding, at least on the busiest lines? All they really have to do is replicate what they did with the Silver Line buses, install TAP card readers at the back doors. At the very least for the 704, 720, 733, 754, 757 as soon as possible. As I read Measure M, there were funds for this sort of improvement. When is Metro going to start installing real-time arrival screens for bus connections at rail stations and the most popular bus stops? Will Metro help the City of LA get out of, or fix its contract with JC Decaux to build new shelters? Some of the busiest bus stops in the system do not even have a shelter. Will Metro push cities to paint transit-only lanes? Will it partner with them to proactively fight for them? No one should be surprised that Metro’s bus ridership numbers are down—Metro hasn’t given the bus system the attention and care it deserves for a long time. Metro only has ~20 people at its headquarters working with bus drivers serving 800,000 riders a day. One staff person per 40,000 bus riders. Metro needs to at least double the number of people doing this job. Right now, they are only able to respond to emergencies like a 9-1-1 call or a bus breakdown. With more staffing, they could focus on reducing bus clumping and getting buses to their destinations on time. Like many riders, I’d encourage Metro to pursue grade separation along the Blue and Expo lines near downtown LA, and also plan for an underground bus tunnel similar to the one in downtown Seattle. That could reduce travel time to downtown. At other busy intersections, like Wilshire/Santa Monica, Beverly Hills should put in a bus-only lane that allows it to jump to the front of the waiting vehicles. In the overwhelmingly likely event Beverly Hills refuses, Metro should pursue state legislation to overturn Beverly Hills. I also echo comments above about how the bus system is where the bulk of the ridership comes from and efforts should be directed at improving service. And just by looking around on buses, it is clear that most riders do not read the Source, and so perhaps some outreach to figure out the concerns of ordinary riders is in order. For me personally, both in L.A. and Denver, I usually do what is the most convenient, which tends to be prioritized to the following: 1. the fastest, 2. not paying for parking, and 3. when I anticipate getting drunk. Everyone values their time so it invariably becomes a tradeoff between how much of a hurry I am in vs. how much it will cost me. The availability of parking is an issue. If people have access to a parking space, they will buy cars, but in quite a few transit favored locations it is entirely possible to live without car ownership. The city ordinances should reflect this by reducing or eliminating minimum parking requirements. I wonder whether the “new” fare scheme had affected ridership. When it was rolled out, I thought it was Metro encouraging people to do the most efficient thing by transferring. I wonder if it possible that the changes turned off some folks who couldn’t figure out how to transfer but had their single-seat ride made longer or altogether eliminated as a result of the service changes. Information like this, especially changes to service, should be publicized in non-English media around the region. Finally, can we offer a discount fare for riding with TAP or make it more difficult to pay with cash? There are way too many people paying cash. Even all-door boarding on the Silver Line is not enough to entice some people to stop fumbling for change. Not saying the ridership on Metro is not declining, however Metro is moving some of its lines to other transit agencies, like Foothill. Hence Metro’s numbers will decline. Why do people go way back to show a decline, this is before all the giveaways and before Foothill. The bus system is still unreliable. Buses often delay(more than 5mins), stops are too close and inefficient(only 1 to 2mins away by walking), and many routes are infrequent (more than 30mins), these caused ridership continue to drop. Suggestions: 1. Expand the bus network every year: Introducing new routes, increasing the frequency on existing routes, repeal or replace or merge those routes with very poor ridership. 2. More regional transit hub in the city, like the El Monte Station, Harbor Gateway transit center. 3. buses priority adjustment, more bus lanes on busy streets, signal priority 4. organization or backup, enhance buses services when necessary, even though it’s weekend or holiday, such as major events, parades, sport games, concerts. In the central core you can get around faster by using Metro Bikeshare than by using the bus. Honestly, all this effort at making bike travel easier, as well as increased congestion, has made walking and biking more useful, especially for trips where you need time certainty. Buses are faster than biking but are more unreliable because of bunching and traffic congestion elsewhere on the route. From what I’ve seen, the best way to increase bus ridership is to revamp the lines and increase frequency. Most of the Metro bus lines (and those operated by the other regional operators) are extremely confusing and often times either don’t get to where I want to go, or do so in a very circuitous route. We should be treating bus lines like rail. I think Metro should look at what Houston did with their bus network (to great success) and emulate that. Our bus lines need to be more grid-based, emphasizing frequent service and transfers rather than trying to maintain one-seat rides. From where I am in the Arts District, I would gladly take the bus to get around DTLA, but the circuitous nature of the routes nearest me create such great detours (or offer such infrequent service) that it’s simply worth it to drive instead, and that’s something I’ve found is true of most places I want to get to using Metro buses. It’s also extremely confusing as to where buses go. If I didn’t have a smart phone and could look up routes with Google Maps, I would never even think about stepping foot onto a bus in LA for fear of not knowing where I’d end up. A simpler, grid-based system fixes both the frequency and confusion issue. Another problem is that stop frequency is far too high, often with a stop every single block or more. This should be reduced to one every-other block at the very least. Metro should invest more in dial-a-ride services to serve those that need the closer proximity stops and reduce the number of stops for everyone else. Metro needs to stop forcing people to take rail, plain and simple. And I’m sorry but the excuses for having Short Lines is ridiculous. You seriously mean to tell me that the reason the 704 has a short line is because it duplicates BBB Line 1?? So what, I don’t see that excuse being used at night. Now as a result of that excuse I’m being forced to either waste more money use the Expo Line or wait 30 min for the next 704 to show up. There, that’s one prime example of why I’m using transit a lot less now.